REDUCED to $264,900. 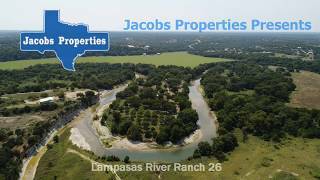 Lampasas River Ranch 26 is located within the River Ridge Ranch development just north Austin. With approximately a half mile of accessible Lampasas River frontage this premium tract is perfect for a full time residence or a weekend retreat. THE LAND: WONDERFUL! BEAUTIFUL! SCENIC! ALL of these descriptions fit the Lampasas River Ranch 26. From the elevated building site with far reaching panoramic views to the accessible flowing waters of the Lampasas River this property is unbelievable. Live oaks and mesquites cover the hill top building site and overlook the hay meadow and native pecan orchard below. The peninsula is covered in lush grass and mature pecan trees surrounded by the Lampasas River. RIVER RIDGE RANCH: River Ridge Ranch development is a premier gated rural community with building and deed restrictions. The development is established with numerous existing homes and improvements in excess of $1m. Riding and hiking trails are available for all owners and their guests. Four community parks offer varying amenities with two having river access. River Ridge Ranch POA is an active association with affordable annual fees of $450. This is a rare opportunity to be a part of a restricted rural community with the enjoyment of the Lampasas River. LAMPASAS RIVER: The Lampasas River Ranch 26 has approximately one third mile of accessible flowing Lampasas River frontage. You will enjoy your own beachfront access and the clear waters of the Lampasas River. White stone bluffs rise to the sky directly across from the peninsula point location. This point is covered in huge pecan trees and provides the perfect park like setting for your family gatherings. Name your activity: exploring, swimming, nature walks, fishing, hunting, kayaking...they are all possible along the banks of the Lampasas River Ranch 26. IMPROVEMENTS: This choice building site on the Lampasas River has a stacked stone wall, gravel road accessing the hay field and ATV trail for accessing the river. Overhead electric is available on River Ridge Ranch Road. Owners are responsible for their own water well and septic systems. LOCATION: The Lampasas River Ranch 26 is conveniently located one hour north of Austin, 30 minutes from Georgetown, 20 minutes to Killeen and only 10 minutes to Stillhouse Hollow Lake. This Bell County hill country ranch is waiting for you. This is a restricted access gated community and 48 hours notice required for an appointment. Call Mel Simonton, 940-659-8042, for an appointment. Buyers broker/agent must be identified on first contact and must accompany buyer prospect on first showing and all subsequent showings to be allowed full fee participation. If this condition is not met, fee participation will be at sole discretion of Mel Simonton, broker associate, Jacobs Properties. Lampasas River Ranch. Lampasas River Property. Hill country river ranch. River Ridge Ranch. Hill country homesite. Ranch in Bell County. Ranch near Austin. Hill country ranch. Lampasas river horseback ranch. Lampasas River fishing. Lampasas River kayaking. From Killeen south on Hwy 195 then right on River Ridge Ranch Road. This is a restricted access gated community and 48 hours notice required for an appointment. Call Mel Simonton, 940-659-8042, for an appointment.